In most cultures where the scythe was once the predominant harvesting tool, axioms which refer to the importance of “peening” (hammer shaping the edge) are still commonly heard in the rural areas. For instance, “Peening is to the scythe blade is what bread is to the mower” or “He who sleeps while peening will wake up while mowing”. In addition, references are made to the fact that only after several peenings (usually 3 to 5) does a new scythe blade perform “as it should”. One of the reasons, I think, is simply because very few people prepare the edge as carefully and thoroughly as they should prior to the first peening. I will explain elsewhere on this website why failing to do so results in numerous cracks along the edge. Some of these are visible to the naked eye and others are microscopic. The whetstone wears off some of them during the first 3 to 4 hours of use, whereupon any serious mower would re-peen the edge again–this time with fewer of those “invisible” cracks remaining…and the process continues. Secondly, many blades of the past did not come from the factory as well pre-peened as some (though by no means all) come today. It requires considerable time and patience, for instance, to make a new Russian blade ready to cut. These days, many mowers who purchase such a blade will simply expedite the process by first using a file, then with the edge already thinner, follow with the hammer. But there is another reason for the peening which the old mowers “understood” and the science of metallurgy can now substantiate. Anyone with enough experience peening new and used blades–particularly if one has a chance to alternate between them–will have noticed that, relative to a well-seasoned one, a new blade peens “like butter”. Already upon the second peening the attentive mower will feel a noticeable difference in hardness. The difference is less at each successive peening, but exactly how it progresses or when it reaches the maximum is still somewhat uncertain. For years I asked all those who mentioned the hardening effect, “How much harder?” The answer was either a blank look or “I don’t really know”. Even within the scythe industry I have never found anyone with actual figures. They simply don’t have them. No testing of the peened zone (primary bevel) has been done, partly because it takes very sophisticated equipment to test such thin metal. While every scythe factory has a Rockwell hardness tester, these are not even that accurate in testing the main body of some extremely light old blades. Most have in fact been re-set, so that instead of the common 150 lb., they use half that force and then the results are computed to indicate the classical scale. Several years ago Dr. J. C. Thornley of the Research and Productivity Council tested a few blades for me in their very well-equipped metallurgy lab in Fredericton, Canada. They use the Vickers method for most of their work and it is certainly more time consuming than the Rockwell test. We did not try any edges back then, but in 2004 I approached him with a somewhat more challenging task. The report is presented below. The following is a web version of the report. This short report is concerned with measuring the hardness close to the cutting edge of a scythe blade that has been sharpened by controlled hammering of the steel close to the blade edge. This hammering thins the steel locally close to that working edge, thus making, or helping to make, a cutting edge. At the same time it is quite clear that the steel will be cold worked in this region and this would be expected to result in some local work hardening. The extent of this work hardening was not known and the work described here was performed as a first step in determining the extent, if any, of any hardness increase resulting from hammer sharpening. 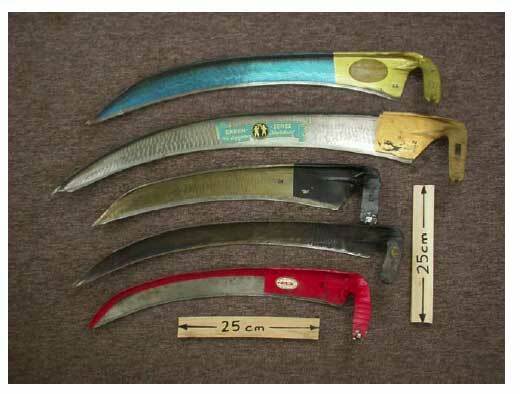 The blades for testing were provided by Mr. Peter Vido and are shown in Figure 1 below. Figure 1. The blades are numbered 1 to 5 from top to bottom in this photograph. The uppermost one is of contemporary Slovenian production. Blade #2 is a pre-war Austrian blade and #3 is also Austrian but of 1950’s vintage. The all dark blade, #4, is Turkish and perhaps 30 or 40 years old while blade #5 is of current Chinese production. Two methods were tried for determining the hardness close to the blades cutting edge. One method was to measure the hardness directly by making Vickers diamond pyramid hardness impressions close to and remote from the cutting edge. The other was to cut sections from the blade edge and then to prepare these sections and use a microhardness testing machine to measure the hardnesses. Of these two methods only the second one produced reliable results and only the results from this testing method will be presented here. A disadvantage of using this procedure is that pieces have to be cut out of the blade, causing damage to the blade. This damage can be relatively minor or can make the blade unusable. Only one blade was tested this way in this instance. Three sections were cut out of the #1 blade. As it says in the caption to Figure 1 this blade was a current Slovenian blade. It had been factory hammered three times with additional hand hammering over about three inches (about 7 or 8 cm) close to the heel. The positions at which sections were taken from the blade are shown in Figure 2. Figure 2. The three notches in the blade were made by cutting small samples out of the blade for hardness testing. Each sample was set in plastic to show the cross section of the cutting edge and was then polished, finishing with 1 µm diamond paste. The hardness impressions were then made on these prepared sections. The sections were numbered 1, 2 and 3 going away from the heel of the blade that is, right to the left in the photograph. The average hardness in the “core” of the blade, at all three section positions, was about 430 Vickers diamond pyramid number (VHN). This corresponds to a hardness of about 44 Rockwell C. (A 10 kg load was first used for this core hardness testing.) The core hardness was also measured using a microhardness testing machine. The result from this testing was about 460 VHN, corresponding to about 46 Rockwell C, in reasonable agreement with the Vickers macrohardness results. Microhardness tests were then made closer to the cutting edge. These tests showed that the hardness increased only very slightly in the sections taken from the positions which had simply been factory hammered but there was a modest hardness increase, to about 560 VHN (53 Rockwell C), in the region that had been hand hammered. (The hardness close to the cutting edge was only measured by a microhardness method.) These results are shown graphically below in Figures 3 and 4 and the hardness positions are shown in a separate sketch. Figures 4. Test results from sample #1. The graph gives the results from the two samples taken away from the heel. (See figure 2 for the position of these samples.) There is little change in hardness at these positions as the blade edge is approached. Figure 5. This sketch shows the typical positions at which hardness impressions were taken. The hardness testing did not show a major degree of work hardening towards the hammered edge of the scythe blades. In the case of the two sections taken through factory hammered edges the degree of work hardening was little or none. In the case of the single section taken though a hand hammered edge there was an indication that the hardness had increased by about 10 to 20% close to the working edge of the blade. Although Dr. Thornley refers to the increase in hardness as modest, I consider it actually rather significant, and higher than I expected. Remember, this was after the first peening (by hand). Most hand saws and axes were traditionally tempered to approximately 45 Rc. If the makers could have hardened them further without sacrificing their “toughness” (ability to withstand damage), they would have. At that level of hardness each 10% increase was a respectable accomplishment. Secondly, the test did not include the last 1mm or even 1/2mm–the zone which actually does the cutting and determines retention of keenness. That portion I (and my technician friends in Austria) suspect ends up considerably harder. Yet at the same time, any experienced mower who has been peening well knows that the edge retains all the toughness it really needs. Some may wonder why no significant difference in hardness was noted between the factory-peened edge and the main body of the blade. This is because the manufacturer’s peening is designed to make the steel “flow” more than “pack” (affected by the sequence of blows and the shape of the hammering “kern”.) The traditional process packs the metal more in relation to how little it is moved. Of course, not every hand peening method will have exactly the same effect.